The graphics representing the markings are not in chronological order. They have been grouped for convenience sake and they have been designated with a number for purposes of reference only. Many are based on actual observations initially recorded with field sketches. Others are based on photographs by the author and a number of other observant individuals. Each was then been redrawn by the author / illustrator of this article. William Beatty reportedly started making axes and edge tools in Waterville, Pennsylvania in 1806. William was one of three sons born to Thomas Beatty, a farmer who had immigrated from Ireland in the last quarter of the 1700s. William's two brothers, John C. and Robert C. were also quite active in the business of making edge tools. William's son, William P.(enn) was active under a few different company names. There were additional Beattys whose names also appeared on tools. One was Thomas F. and another T. Beatty . Still others included R. H. Beatty, J. Beatty and possibly J. C. and J. F. Beatty. Thomas is reported to have worked in Pottstown, Pennsylvania which is not excessively far from Chester. At times he worked with a John Beatty who may have been a brother, cousin or even an uncle. Other Beatty individuals, presumed to be relatives, were also involved in making tools. Even some of the Beatty women became involved in the businesses from time to time. The interaction between the family members included some individuals with the name Ogden. The families were connected through marriage as well as through the various businesses. The exact years in which the sons John C. and William P. were involved in business with the father and/or each other are somewhat confusing. It appears that at times they were working independently and at other times they were working together. William, the father, is reported to have died in 1843 which means the business was carried on by at least one son and possibly more at various times. The variations of the name on artifacts add to the confusion due to the inclusion of different locations and different devices or logo variations. There were different locations involved at various times, some names of which appeared on different tools. Those other locations include Media and Village Green. Philadelphia is also sited as a location but it is believed that was the location of a business office and not a manufactory. 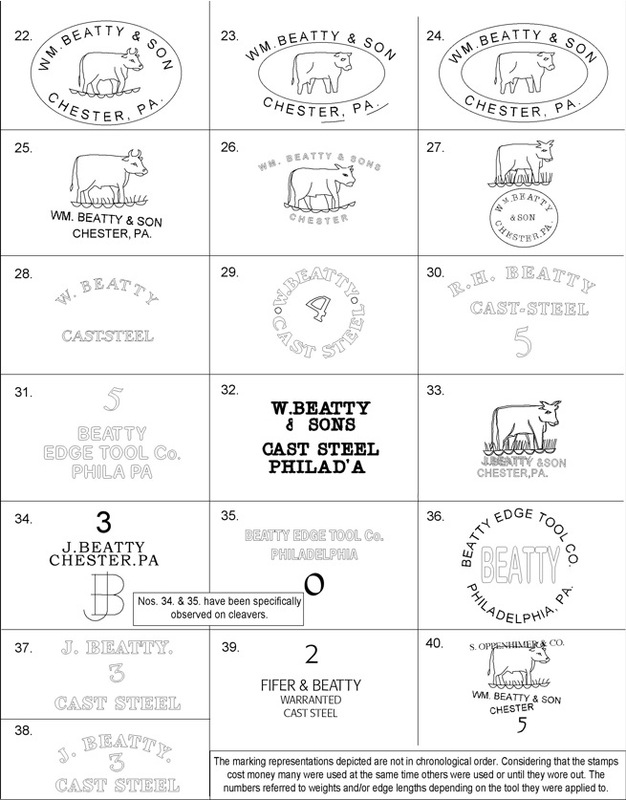 Some tools are known with the name BEATTY EDGE TOOL CO. / PHILADELPHIA, PA. on paper labels. Some time around 1905, John B. (eatty) Black Co. took over the entire operation and continued to offer all the Beatty labels along with one called ROYAL. By the 1920s changing technologies and the wide spread financial difficulties plaguing the country resulted in the company going into receivership. In 1924 Philip A. Wright bought all the assets at auction. Shortly thereafter, Clifton B. Drake acquired the remaining tools and via some arrangement with Wright proceeded to dispose of those tools. (Right) Later impressions or stampings sometimes included the abbreviation for William as WM with the M underlined. Eagle used on Beatty drawknife and axe along with location of Media, PA. Possibly the earliest image used by Beatty. Steer marking variations as struck into some axe cheeks, drawknife blades and other tools made by the Wm. Beatty Co., Wm. Beatty & Son. 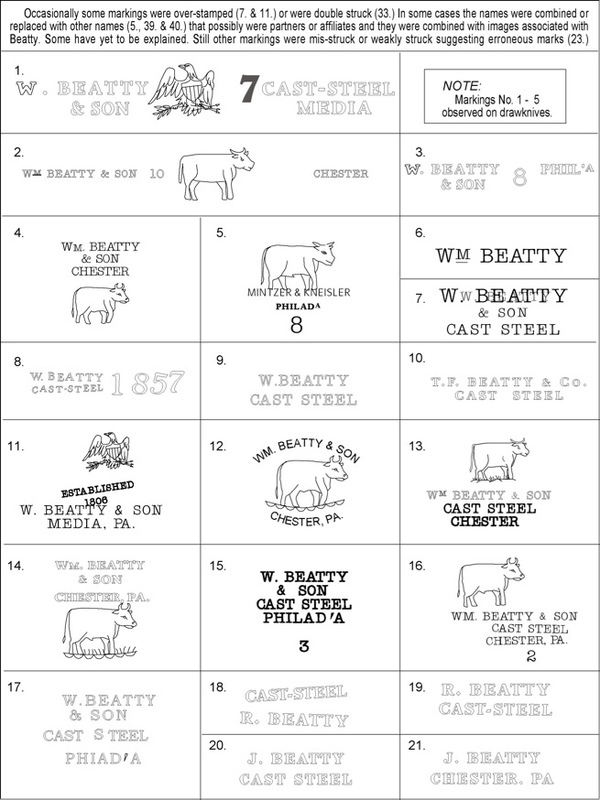 or one of the other companies that included the Beatty name. There may be additional examples that have yet to be recorded. No sequential chronology is intended. 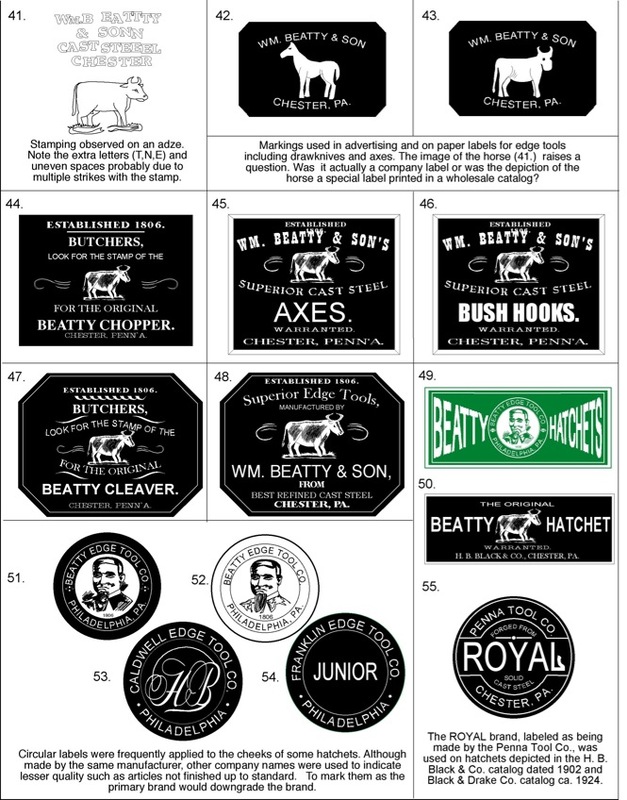 This company is included in the PHILADELPHIA AXE MAKER booklet.